Rep. Mark Pocan: Betsy DeVos is unfit to lead the Education Department. It's time for her to resign. Rep. Mark Pocan Betsy DeVos is unfit to lead the Education Department. It's time for her to resign. DeVos' confirmation hearing raised many red flags. Now America's children are dealing with the consequences of her incompetence. Last week, Secretary of Education Betsy DeVos appeared before the House Appropriations Committee to attempt to justify the Trump administration’s 2020 budget request. During the committee hearing, members of Congress — Democrats and Republicans — had the opportunity to ask her about a number of programs and funding decisions that we found problematic to our students, educators and schools. Her answers only reinforced a truth we have known for two years: Secretary Betsy DeVos is wholly unfit to oversee this vital department and must resign before her actions wreak even more havoc than has already occurred. When Trump first nominated Betsy DeVos to lead the Department of Education, there were many red flags that both Congress and the American public noticed. When Trump first nominated Betsy DeVos to lead the Department of Education, there were many red flags that both Congress and the American public noticed. Most alarming was the fact that DeVos — who was never a public school student, teacher, principal, superintendent, or administrator — brings the least amount of public school experience of any secretary in our nation’s history. During her confirmation hearing, DeVos' lack of background in public education became even more clear when she gave downright incoherent, confusing, and non-sequitur responses to questions on some of the most pressing issues facing American students today. 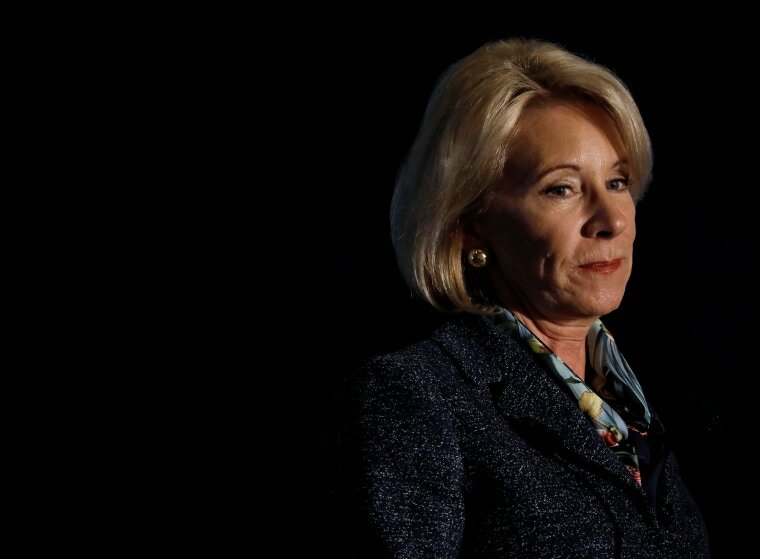 She also failed to grasp the critical role that the Department of Education plays in students’ lives, especially for those who may have special needs. When she said that enforcement of the Individuals with Disabilities Education Act — a federal program that is our nation’s leading source of funding for students in special education programs — is “best left to the states,” her nomination should have been withdrawn. She was instead confirmed by the Senate with Vice President Mike Pence casting the tie-breaking vote, the first time in history a vice president has used that power to confirm a nominee to the Cabinet. Over the next several months, DeVos did not change her course on students with special needs or any other public education issues. Rather, her confirmation hearing stood as a prescient display of her fundamental lack of understanding and the cruelty she would deploy as the head of an agency responsible for more than 50 million students and three million teachers in public school systems, and nearly 20 million students in American colleges and universities. Over the last two years, DeVos has repeatedly failed to serve students in America’s public schools, choosing to push forward her misguided and grievous plan to rapidly expand the role of charter schools in our education system. Despite charter schools having a significant failure rate — including some in my home state of Wisconsin that I have asked DeVos to come tour with me — she has pushed for additional funding, including an additional $60 million in her latest budget request. But DeVos’s assault on public education does not end with her ultimately retracted call for the elimination of funding for Special Olympics, attacking programs for children with special needs, or propping up failing charter schools. She has also worked to revoke guidelines on affirmative action and strip protections and rights for LGBTQ students — including children who identify as transgender. Most recently, she also refused to answer if she thinks schools should be allowed to discriminate on the basis of sexual orientation and gender identity. Special Olympics survived Betsy DeVos' attempt to axe our school programs. Here's what we do for America's kids. Her complete disdain for American students also does not end with K-12 education. DeVos has rolled-back Obama-era regulations on for-profit-colleges that protect students, including fighting to block a law that would help students and graduates who have large amounts of debt and questionable degrees. She is also failing at oversight; student loan servicers have been allowed to go rogue while the agency charged with serving American students, the Federal Student Aid office, turns the other way. Despite the crushing amount of student loan debt owed by Americans today, DeVos has tried three times to eliminate the Public Service Loan Forgiveness Program, taking away a program that aids our nation’s teachers, firefighters and public servants. When you take DeVos’s record at the Department of Education as a whole, it’s clear she does not value equal access and opportunity for all students. Rather, DeVos has sided again and again with the special interests and the deeply hurtful and discriminatory policies of the Trump administration. Indeed, her actions are really just part of a larger pattern under Trump where the government is focused on serving Americans who are white, wealthy, and privileged. DeVos has abandoned students in our cities, those that come from underprivileged backgrounds, those who identify as LGBTQ, and many, many more students who do not fit into her narrow worldview. When you take DeVos’s record at the Department of Education as a whole, it’s clear she does not value equal access and opportunity for all students. Our public education system plays a critical in expanding opportunities for the next generation of Americans and ensuring that our students — especially for those in marginalized and underserved communities — have the resources they need to succeed. However, more than two years into the Trump administration, the damage that is being done by the Department of Education will cause lasting, lifelong effects for millions of students and their families. Given her continued failure of leadership, it is time for Betsy DeVos to step down from her role and allow a committed educational professional to stand up for our nation’s students, teachers, and administrators and support public education. Rep. Mark Pocan, a member of the Democratic Party, represents Wisconsin’s 2nd Congressional District in the U.S. House of Representatives and serves on the Appropriations Committee. He is co-chair of the Congressional Progressive Caucus.